Supernatural shine, super smooth and non-sticky with nourishing hydration and long lasting natural colour. Our Enlightened Gloss Nourishing Mineral Lip Shine is infused with coconut and antioxidants to help support superior lip health. This gloss is for anyone who wants to hydrate their lips and add gorgeous sheer colour with a glossy shine. Beautifully hydrates your lips with long lasting mineral colour without feeling sticky. Our Enlightened Gloss Nourishing Mineral Lip Shine is infused with coconut and antioxidants to help support lip health. Carthamus tintorius (safflower oil), oleic/linolenic polyglycerides, euphorbia cerifera (candlila) wax, simmondsia chinensis (jojoba) esters, cocos nucifera (coconut) oil, theobroma cacao (cocoa) butter, simmondsia chinensis (jojoba) seed oil, silica, olea europaea (olive) oil, parfum (natural), tocopherol eupatorium rebaudianum bertoni (stevia) leaf extract. May contain: calcium sodium borosilicate, eclipta prostrate extract (natural colour), media azadirachta (neem) leaf extract, manganese violet, titanium dioxide, iron oxides, mica, tin oxide. Apply to lips anytime, anywhere. 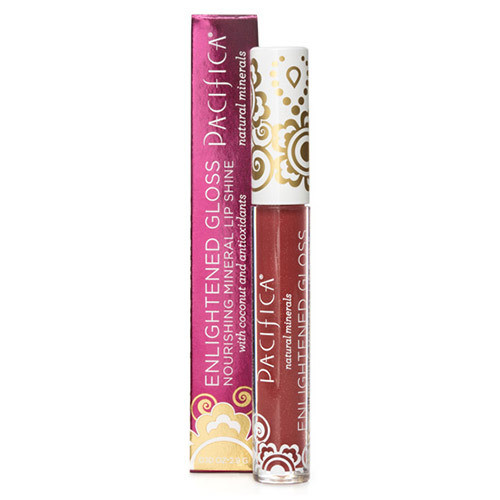 Below are reviews of Pacifica Enlighten Mineral Lip Gloss Ravish - 2.8g by bodykind customers. If you have tried this product we'd love to hear what you think so please leave a review. Supernatural shine, super smooth and non-sticky with nourishing hydration and long lasting natural colour. Our Enlightened Gloss Nourishing Mineral Lip Shine is infused with coconut and antioxidants to help support superior lip health.